These are charming little scrolls, aren't they? I had never seen a fiddlehead fern until I moved to New York. Largely uncultivated, and with a fleeting growing season, you'd be lucky to find them even here, although they do grow wild throughout New England. So if you see them, grab them. It might be your only chance. I've seen recipes for fiddleheads that ask you to boil them twice, switching the water between rounds. I don't think such delicate harbingers of spring deserve such harsh treatment, and anyway, I hate the idea of boiling all of the life out of them. Once a year, when I find them, I simply saute them, as I have done here. If you're only going to find them occasionally, you may as well let them sing for themselves. 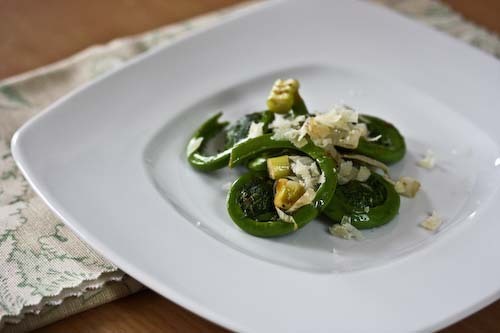 To prep your fiddleheads, cut the touch stems off, including any brown parts. Run them under cold water in a colander, then place them in a bowl of water and swirl around. Dry them on paper towels. Heat the olive oil in the pan over medium heat. Add the garlic and sauté until fragrant, about 2 minutes. Add the scallions and the fiddleheads, cover, and cook for 4 minutes. Uncover, stir, and continue to cook for another 4 minutes. Remove from heat and sprinkle with salt and pepper to taste. Squirt the juice of half a lemon on top. 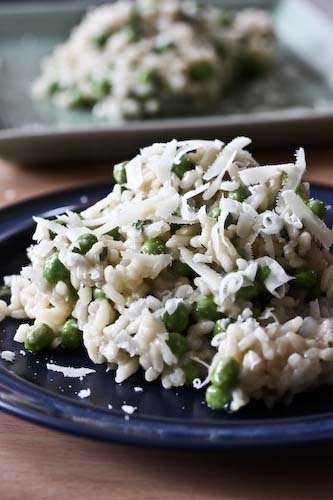 Spoon onto plates and serve with a grating of parmesan cheese over the top. UPDATE: Thanks to two commenters for pointing out that the double boiling often recommended for fiddleheads is used to reduce the risk of a certain bacteria that is associated with them. So be careful with your produce, and see the comments for more information. I wish these were common in California. I have been wanting to try them, but no luck. I love the simplicity here. I saw these just the other day at Whole Foods, but had never seen them before, so I passed. I guess I'll be making a trip back. Thanks for the recipe! 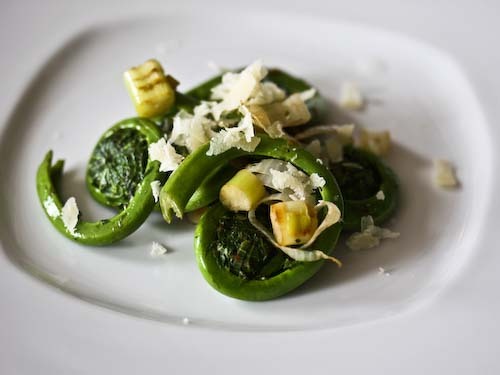 The idea behind boiling them two times is to get rid of a nasty bacteria that often makes fiddleheads its home. I have prepared them many times like you do without any adverse effects but trust me I am not going to partake in eating them until at least next season: I've had a terrible 24 hours dealing with the aforementioned bacteria - constant nausea and severe diarrhea. Read it up, poisonings are relatively common. It's true Fiddle heads can make you sick if they have not received an initial blanch to kill the pathanogens. I do not double boil however, and single 2 minute boil in salted water does the trick for me. Thanks for the lovely pix. I ve never heard of fiddlehead , Interesting! We get those here but they remind me of bugs. I can't bring myself to try them although I hear they are delicious. I love, love, love fiddlehead ferns! Just had them recently at a restaurant but have never cooked them. Now I want to! Nice post.